Monitoring and Cartography: all in one. NAVIOP CHARTS is the revolutionary NAVIOP application which combines monitoring system and cartography in only one display. NAVIOP CHARTS offers you the integration between NAVIOP monitoring system and Electronic Navigational Chart (ENC). 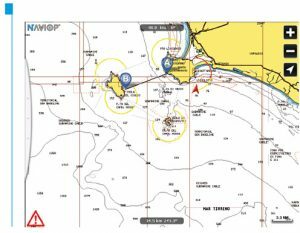 The chartplotter displays the ENC along with the position, heading and speed of the ship, and it is fully integrated with NAVIOP Monitoring System. NAVIOP CHARTS application is available on 7″ and 15″ display.